Human rights are enshrined in numerous international treaties, including the Universal Declaration of Human Rights; the International Covenant on Economic, Social and Cultural Rights; and the International Covenant on Civil and Political Rights. However, the right to health is limited by the principle of progressive realization, which has left loopholes allowing the deferment of fundamental human rights. Many of these fundamental human rights—such as the rights to food, water, and sanitation—are critical determinants of health (see Box 1). Indeed, in its General Comment 14, the United Nations Committee on Economic, Social and Cultural Rights interprets the right to health as an inclusive right that encompasses the underlying determinants of health and health care. The importance of these fundamental rights to health is demonstrated by the fact that access to them accounted for most of the reductions in child and maternal mortality between 1990 and 2015. These rights are also among the Sustainable Development Goals (SDGs). 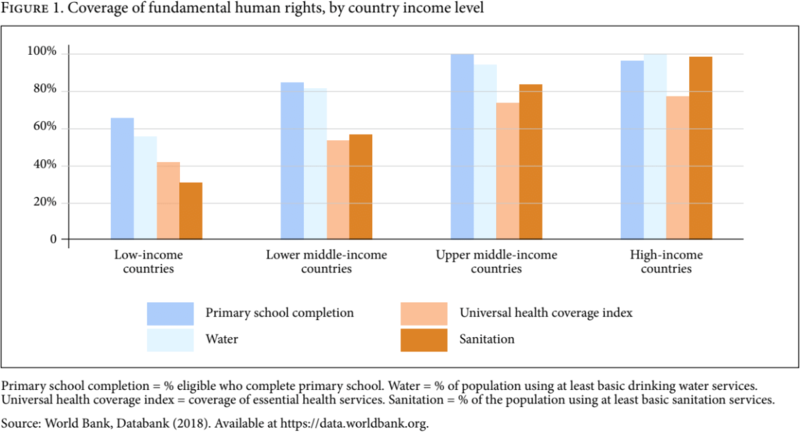 However, many people throughout the world—particularly those in low-income countries—do not have access to them (see Figure 1). The United Nations Committee on Economic, Social and Cultural Rights, in its General Comment 3, has tried to compensate for the loopholes that facilitate governments’ and their development partners’ complacency in fulfilling these rights by defining non-derogable minimum core obligations that establish a minimum set of protections that are immediately applicable to all people in all nations and not subject to the flexibilities permitted by progressive realization. Technically speaking, it would be financially feasible to remedy these deprivations relative to the overall level of global resources. For example, the annual cost of providing improved water and sanitation for the unserved is US$28.4 billion, which is a mere 1.6% of annual global military expenditure. However, in order to build a state-citizen relationship and to generate ongoing tax revenue, these rights should ideally be funded through a financial process that is transparent, accountable, and responsible and includes domestic revenue generation for public services. The benefits of relying on domestic resources instead of overseas development aid are multiple: less volatility, more citizen participation, and a focus on local (as opposed to donor) priorities. That said, government revenue in low-income countries is minimal—on average, it is less than US$100 per capita—and government expenditure on health is less than US$20 per capita. Therefore, while the responsibility for fulfilling fundamental human rights lies within national borders, sometimes governments’ ability to finance such fulfilment lies out of their reach. Tax abuses have a negative impact on fundamental human rights, yet human rights scholars have largely ignored the need for revenue, and tax scholars rarely analyze laws and policies through a human rights lens. This essay discusses government revenue and public services as they relate to human rights and explores who the relevant duty-bearers are, as well as what actions they could take to increase the chances of everyone, everywhere, having access to their fundamental human rights. Ensure the right of access to employment, especially for disadvantaged and marginalized individuals and groups, enabling them to live a life of dignity. Ensure access to the minimum essential food that is nutritionally adequate and safe. Ensure access to basic shelter, housing, and sanitation, and an adequate supply of safe drinking water. Provide essential drugs as defined under the World Health Organization’s Action Programme on Essential Drugs. Ensure free and compulsory primary education for all. Ensure access to a social security scheme that provides a minimum essential level of benefits that cover at least essential health care, basic shelter and housing, water and sanitation, food, and the most basic forms of education. Source: Office of the United Nations High Commissioner for Human Rights, Fact sheet no. 33: Frequently asked questions on economic, social and cultural rights (2008). Available at https://www.ohchr.org/Documents/Publications/FactSheet33en.pdf. The pathway between government revenue, government expenditure, public services, and fundamental human rights is known. For example, a 10% increase in tax revenue leads to a 17% increase in public health spending in low-income countries, and increasing public health spending by 1% decreases under-five mortality by 0.86%. However, the limiting factor in many countries is government revenue, and before identifying global mechanisms to plug these gaps, leakages from current revenue streams should be curtailed. Lost government revenues as a result of international and national injustices and inefficiencies include tax waivers, the failure to tax wealthy citizens and the informal sector, corporate tax avoidance, corruption, and debt repayment by the state. Taxes are the main contributor to government revenue in all countries. However, tax as a percentage of gross domestic product (GDP) is much lower (18%) in low-income countries than in high-income countries (40%). Reasons for this tax gap include undertaxing the informal sector and wealthy citizens, granting tax waivers, and tax avoidance by international corporations. Domestic and international tax avoidance and waivers result in the burden falling on small domestic companies and individual taxpayers, which can often mean insufficient revenues that lead to reduced social spending and thus reduced access to fundamental human rights. The resulting fiscal deficits may skew taxation toward indirect taxes, which tend to be regressive and place a burden on low-income groups, who often have the least voice on the political stage. The informal sector accounts for approximately 40% of GDP in many low- and middle-income countries. Reasons for failing to tax this sector include logistical problems (especially in agricultural societies), weak financial systems (which inhibit the tracking of companies’ and individuals’ tax obligations), and a lack of capacity. However, a further reason for undertaxed wealthy citizens and companies is their political influence on tax policy formulation and administration. Tax incentives are widely used to attract foreign investment, despite the lack of evidence that they promote economic growth. Countries often compete with one another to attract foreign investment by offering incentives such as tax holidays, which sets off a race to the bottom in which public purses suffer and shareholders benefit. While tax avoidance in the informal sector and decisions about tax incentives fall under the remit of national governments, tackling international corporate tax avoidance is the responsibility of a broader group of actors, as explained in the next section. In low- and middle-income countries, 20% of government revenue is derived from corporate income tax, compared to 10% in wealthy countries. Therefore, multinational corporations (MNCs) have a substantial impact on government revenue in all countries but are critically important in low- and middle-income countries. Corporate income tax is payable only when MNCs realize profits. Taxing profit allows for avoidance opportunities, including overstating costs (including intangible services such as managerial support and interest payments in thinly capitalized projects) when selling to related entities (transfer pricing). In theory, related entities use an “arm’s length” price and charge subsidiaries the same price as they would an unrelated company, but this is often not done in practice. Base erosion and profit shifting is a term used to describe the shifting of taxable profits out of the country where the income was generated into low-tax and secrecy jurisdictions (also called tax havens) where there may be little or no economic activity, using transfer pricing between related entities to reduce the amount of tax due. In addition, tax treaties between countries are used to minimize tax by diverting profit via states with a favorable treaty in place. Who are the duty-bearers for tax avoidance and what can they do? The United Nations Guiding Principles on Business and Human Rights direct MNCs to avoid adversely affecting human rights, and guidelines from the Organisation for Economic Co-operation and Development state that MNCs should contribute to environmental, economic, and social progress. Despite these guidelines, international corporate tax avoidance is estimated to be US$500–650 billion each year, one-third of which is from low- and middle-income countries. Leaders of MNCs that minimize tax payments in countries where large proportions of the population have unmet fundamental human rights are duty-bearers and should move this issue up on their agenda by ensuring board-level scrutiny and by reporting profits and taxes paid publicly. Among the strategies to tackle base erosion and profit shifting is one first proposed by the Tax Justice Network and now driven by the G20 and G8 and agreed to by 100 countries, which requires large MNCs to report profits and economic activity, by country, to the revenue authority of their parent company. This information is confidential and shared only with authorities in countries where there is a related entity if there is a bilateral agreement in place. However, an initiative by the Intergovernmental Working Group of Experts on International Standards of Accounting and Reporting (coordinated by the United Nations Conference on Trade and Development) proposes a public framework for country-by-country reporting, with indicators relevant to the achievement of the SDGs, including revenue, tax paid, green investment, and community investment. The Global Reporting Initiative, which sets standards for stock exchanges and thousands of firms, is also developing a draft standard for public country-by-country reporting of tax and other payments to governments. The integration of these two methodologies may produce a robust, public country-by-country reporting framework for the SDGs. Governments are obliged to use their maximum available resources to realize fundamental human rights. However, Nigeria, for example, has 5,000 tax inspectors for a population of 140 million, compared to the Netherlands, which has 30,000 inspectors for a population of 10 million. Regarding international tax avoidance, only eight African countries have units within their revenue authorities that focus on transfer pricing, most of which were established recently. Kenya’s unit uses techniques such as tip-offs from the public and screening processes that flag MNCs doing business in countries with a history of harboring tax abusers. These units face numerous challenges, including high-income countries not responding to requests for information even when a tax treaty is in place, a lack of data for price comparisons to allow estimations of arm’s-length pricing, inadequate capacity, and corruption. An approach taken by Vietnam has been to require domestic subsidiaries of large MNCs to provide a copy of the global country-by-country report to the Vietnamese tax authorities, which reduces the burden on these authorities. Governments that grant tax incentives need to be confident that the economic and development gains as a result of the investments do not outweigh the costs regarding revenue available for public services and fundamental human rights. Recent evidence shows that tax treaties with low-tax and secrecy jurisdictions do not result in additional investment and lead to average revenue losses of 15% of corporate income tax. Challenges to both domestic and international tax abuse in all countries include a lack of political will, as political leaders may have vested interests and wish to exempt specific industries. Other duty-bearers include the home countries (generally high-income countries) of MNCs, which are required to prevent infringements of rights outside their territory by business entities over which they can exercise control. Stock exchanges could exclude MNCs with tax havens in their corporate structure; for example, one-quarter of the MNCs listed on the London Stock Exchange with mining operations in Africa use tax havens. High-income countries should also review their tax treaties with low- and middle- income countries to ensure that there are no adverse spillover effects on fundamental human rights. Enablers of tax avoidance and their professional bodies, including tax professionals, accountants, lawyers, bankers, and the nominees of shell companies, need to appreciate that tax planning often adversely affects fundamental human rights. The world’s largest accounting firms have helped MNCs avoid billions of dollars in taxes. The investment community, including pension fund managers, should stop regarding tax as a cost to be minimized; for example, 75% of pension beneficiaries in the UK feel it is vital that their pensions not be invested in MNCs that avoid taxes, and 78% believe that it is essential that MNCs pay their fair share of taxes in low-income countries. Elizabeth Ashford suggests that there is a web of complex interactions that results in structural injustices and, like Iris Young, believes that the collective that has produced it is responsible. The concept of ownership, which motivates consideration of the links between one’s decisions and others’ lack of fundamental human rights, may drive different choices. Thomas Pogge states that if more people understood their role in poverty, more might try to eradicate it. For example, one link between individual choices and fundamental human rights is the taxes paid by MNCs, and an increased awareness of individual responsibility may drive consumers to choose brands and investments that do not avoid taxes, to vote for governments that act to change unjust global institutional arrangements, and to avoid banks that facilitate tax avoidance. A familiar narrative used to challenge this approach is that action will be ineffective due to corruption by undemocratic governments. However, Pogge argues that some corrupt governments continue to be in power because of a global institutional order that enables the exchange of finance and weapons for natural resources. The critical determinants of health are water, sanitation, health care, and education. These are fundamental human rights and are included in the SDGs. They are most sustainably provided for by public services and financed with domestically generated revenue. Barriers to governments meeting their minimum core obligations for the right to health include insufficient revenue. International corporate tax avoidance is among the reasons for this. Action is required at many different levels by a range of duty-bearers. These include MNCs, governments, professional enablers of tax avoidance, and individuals who are in a position to make voting, banking, consuming, and investment choices. Bernadette Ann-Marie O’Hare, MD, FRCPCH, MPH, is a senior lecturer in the Division of Infection and Global Health at the University of St. Andrews’s, UK, and the College of Medicine, Blantyre, Malawi. Please address correspondence to the author. Email: bamo@st-andrews.ac.uk. Copyright © 2018 O’Hare. This is an open access article distributed under the terms of the Creative Commons Attribution Non-Commercial License (http://creativecommons.org/licenses/by-nc/3.0/), which permits unrestricted non-commercial use, distribution, and reproduction in any medium, provided the original author and source are credited.
. L. Forman, G. Ooms, A. Chapman, et al., “What could a strengthened right to health bring to the post-2015 health development agenda? Interrogating the role of the minimum core concept in advancing essential global health need,” BMC International Health and Human Rights 13/48 (2013).
. Committee on Economic, Social and Cultural Rights, General Comment No. 14, The right to the highest attainable standard of health, UN Doc. E/C.12/2000/4 (2000).
. United Nations Committee on Economic, Social and Cultural Rights, General Comment No. 3, The Nature of States Parties’ Obligations, UN Doc. E/1991/23 (1991); Forman et al. (see note 1).
. G. Hutton and M. Varughese, The costs of meeting the 2030 Sustainable Development Goal targets on drinking water, sanitation, and hygiene: Summary report (Washington, DC: World Bank, 2016); SIPRI, Arms transfers database (2017). Available at http://www.sipri.org/databases/armstransfers.
. A. Waris and L. A. Latif, “Towards establishing fiscal legitimacy through settled fiscal principles in global health financing,” Health Care Analysis 23 (2015), pp. 376–390.
. C. Fuest and N. Riedel, “Tax evasion and tax avoidance: The role of international profit shifting,” in P. Reuter (ed), Draining development? Controlling flows of illicit funds from developing countries, 1st ed. (Washington, DC: International Bank for Reconstruction and Development, 2012).
. International Center for Tax and Development and United Nations University World Institute for Development Economics Research, Government revenue dataset (2017); World Health Organizaton, Global health observatory data (2017). Available at http://www.who.int/gho/en.
. E. Ashford, “The infliction of subsistence deprivations as a perfect crime,” Proceedings of the Aristotelian Society 118/1 (2018), pp. 83–106; T. Pogge, “World poverty and human rights,” Ethics and International Affairs 19/1 (2005), pp. 1–7.
. International Bar Association, Tax abuses, poverty and human rights: A report of the International Bar Association’s human rights institute task force on illicit financial flows, poverty and human rights (London: International Bar Association, 2013); A. Waris, Tax and development: Solving Kenya’s fiscal crisis through human rights (Oxford: African Books Collective, 2013).
. A. Reeves, Y. Gourtsoyannis, S. Basu, et al., “Financing universal health coverage: Effects of alternative tax structures on public health systems; Cross-national modelling in 89 low-income and middle-income countries,” Lancet 386/9990 (2015), pp. 274–280.
. R. Tamarappoo, P. Pokhrel, M. Raman, and J. Francy, Analysis of the linkage between domestic revenue mobilization and social analysis of the linkage between domestic revenue mobilization and social sector spending (Washington, DC: USAID, 2016); F. Haile and M. Niño-Zarazúa, “Does social spending improve welfare in low-income and middle-income countries?” Journal of International Development 30/3 (2017), pp. 367–398.
. Waris and Latif (see note 6).
. B. O’Hare and I. Makuta, “An analysis of the potential for achieving the fourth-millennium development goal in SSA with domestic resources,” Globalization and Health 11/8 (2015); M. Curtis and B. O’Hare, “Lost revenues in low-income countries” (2017). Available at http://curtisresearch.org/wp-content/uploads/Lost-revenues.pdf.
. J. Slemrod, “Tax systems in developing countries” (keynote lecture at Zurich Center for Economic Development, 2016). Available at http://www.econ.uzh.ch/dam/jcr:79e9554f-e7ac-4068-93e6-1921226ac68c/Slemrod_Speech.pdf.
. M. Moore, “Obstacles to increasing tax revenues in low-income countries” (2013). Available at http://papers.ssrn.com/sol3/papers.cfm?abstract_id=2436437.
. United Nations Economic Commission for Africa, High-level panel on illicit financial flows. Available at http://www.uneca.org/iff.
. Moore (see note 16); G. Brock and H. Russell, “Abusive tax avoidance and institutional corruption: The responsibilities of tax professionals,” Edmond J. Safra Working Paper No. 56 (2015). Available at https://papers.ssrn.com/sol3/papers.cfm?abstract_id=2566281.
. F. Schneider and C. C. Williams, “The shadow economy,” Journal of International Affairs 53/2 (2013), p. 387.
. Moore (see note 16); R. Gordon and W. Li, “Tax structures in developing countries: Many puzzles and a possible explanation,” Journal of Public Economics 93/7–8 (2009), pp. 855–866.
. Moore (see note 16).
. S. N. Stausholm, “Rise of ineffective incentives: New empirical evidence on tax holidays in developing countries” (2017). Available at https://osf.io/preprints/socarxiv/4sn3k.
. Gordon and Li (see note 20).
. D. Hubert, Many ways to lose a billion: How governments fail to secure a fair share of natural resource wealth (Publish What You Pay – Canada, 2017).
. M. Durst, “Improving the performance of natural resource taxation in developing countries,” ICTD Working Paper No. 60 (2016). Available at https://opendocs.ids.ac.uk/opendocs/bitstream/handle/123456789/12797/ICTD_WP60.pdf?sequence=1&isAllowed=y.
. Organisation for Economic Co-operation and Development, Inclusive framework on BEPS (2017). Available at http://www.oecd.org/tax/beps/background-brief-inclusive-framework-for-beps-implementation.pdf. U4 Anti-corruption Resource Centre (2014). Available at http://www.u4.no/publications/tax-motivated-illicit-financial-flows-a-guide-for-development-practitioners.
. Office of the United Nations High Commissioner for Human Rights, Guiding principles on business and human rights (New York: United Nations, 2011); Organisation for Economic Co-operation and Development, OECD guidelines for multinational enterprises (Paris: Organisation for Economic Co-operation and Development, 2011).
. A. Cobham and P. Janský, “Global distribution of revenue loss from corporate tax avoidance: Re-estimation and country results,” Journal of International Development 232 (2018), pp. 206–232; E. Crivelli, R. De Mooij, and M. Keen, “Base erosion, profit shifting and developing countries,” Public Finance Analysis 72 (2016), pp. 267–301.
. A. Cobham, P. Janský, and M. Meinzer, “A half-century of resistance to corporate disclosure,” Transnational Corporations 25/3 (2018), pp. 1–27.
. Organisation for Economic Co-operation and Development (see note 26).
. United Nations Conference on Trade and Development, Guidance on core indicators for entity reporting on the contribution towards the attainment of the Sustainable Development Goals (2018). Available at http://isar.unctad.org/wp-content/uploads/2018/10/Guidance-on-Core-Indicator_ISAR-35.pdf.
. A. Cobham, “Country by country reporting for the Sustainable Development Goals,” Tax Justice Network (2018). Available at https://www.taxjustice.net/2018/10/25/country-by-country-reporting-for-the-sustainable-development-goals.
. International Bar Association (see note 10).
. K. Sharife, M. Kohonen, and D. Alemayehu, Tax us if you can: Why Africa should stand up for tax justice (Pambazuka Press, 2018).
. A. Waris, “How Kenya has implemented and adjusted to the changes in international transfer pricing regulations: 1920–2016,” International Centre for Tax and Development (2018). Available at https://opendocs.ids.ac.uk/opendocs/bitstream/handle/123456789/13401/ICTD_WP69.pdf.
. Tax Justice Network, Vietnam legislates on country by country reporting (2017). Available at http://www.taxjustice.net/2017/04/24/vietnam-legislates-country-country-reporting.
. S. Beer and J. Loeprick, “The cost and benefits of tax treaties with investment hubs: Findings from sub-Saharan Africa,” IMF Working Paper 227 (2018). Available at https://www.imf.org/en/Publications/WP/Issues/2018/10/24/The-Cost-and-Benefits-of-Tax-Treaties-with-Investment-Hubs-Findings-from-Sub-Saharan-Africa-46264?cid=em-COM-123-37872.
. Waris (2018, see note 36).
. Committee on Economic Social and Cultural Rights, General Comment No. 24, State Obligations under the International Covenant on Economic, Social and Cultural Rights in the Context of Business Activities, UN Doc. E/C.12/GC/24 (2017).
. United Nations Economic Commission for Africa (see note 17); Independent Commission for Aid Impact, UK aid’s contribution to tackling tax avoidance and evasion: A learning review (2016). Available at http://icai.independent.gov.uk/report/tax.
. J. P. Bohoslavsky, Illicit Financial Flows, Human Rights and the Post-2015 Development Agenda: Interim Study by the Independent Expert on the Effects of Foreign Debt and Other Related International Financial Obligations of States on the Full Enjoyment of All Human Rights, UN Doc. A/HRC/28/60 (2015).
. Brock and Russell (see note 18).
. Principles for Responsible Investment Initiative, Engagement guidance on corporate tax responsibility: Why and how to engage with your investee companies (2015). Available at https://www.unpri.org/about/what-is-responsible-investment; Christian Aid, Tax avoidance (2017). Available at http://www.comresglobal.com/wp-content/uploads/2017/11/Christian-Aid-Tax-Avoidance-Nov-2017.pdf.
. Ashford (see note 9); I. M. Young, “Political responsibility and structural injustice” (2003). Available at https://www.bc.edu/content/dam/files/schools/cas_sites/sociology/pdf/PoliticalResponsibility.pdf.
. Young (see note 46).
. Pogge (see note 9).
. B. O’Hare, “Active global citizenship: Ethical living to promote human rights,” Health and Human Rights Journal blog (2018). Available at https://www.hhrjournal.org/2018/11/active-global-citizenship-ethical-living-to-promote-human-rights.